Mrs. De Kleermaeker is senior advisor in the Marine and Coastal Systems Unit of Deltares. She has 13 years of experience with both operational information systems and hydrodynamic modelling. This experience has been gained both in Marine and Coastal systems as well as Industrial systems. She has been project leader on a number of national and international projects. In addition she has excellent training skills. She has led the development of the operational early warning system for the Dutch coast, which has been operational since 2013. This system creates forecast for both storm surge and waves and makes use of data assimilation. She has since then applied this knowledge in international project, both for hydrological models as coastal applications. In the field of hydrodynamic modelling, she worked on diverse projects and topics, ranging from design of intake and outfall structures and recirculation studies for desalination and power plant to design of various pipeline systems. She shares her knowledge in generic or specialized trainings, including methods like interactive workshops and serious gaming. She has extended experience as teacher and trainer. 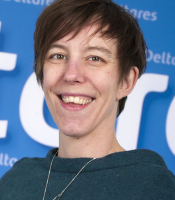 Ms. De Kleermaeker has a background in fluid dynamics, based upon her graduation in Technical Mechanics with specialisation on fluid dynamics. De Kleermaeker, S., Arentz, L.
De Kleermaeker, S., Zijderveld, A., Thonus, B.